You Haven’t Been Cooking Again, Have You Prudence? October 1925 is the start of a very exciting time for John Welles; he’s beginning his pre-med studies at the University of Maryland. John’s deepest personal secret to date, the fact that he wants to study medicine, is becoming a reality. Unfortunately, his first day is overshadowed by the rift that still exists between him and his stepmother, Collie. For three months, John hasn’t received a letter or telephone call from her. As much as he misses her presence in his life, he doesn’t know how to repair the damage. His Aunt Prudence discerns that he’s still upset by the harsh words he exchanged with Collie, so she surprises him with a special breakfast consisting of the dishes he enjoyed as a child on the farm. John teases his aunt about her terrible cooking skills to which Prudence replies that her cook, Lucia, actually made the breakfast. One of the breakfast menu items Prudence and Lucia serve John is fried apples. They’re delicious over biscuits, cornbread, ice cream, pancakes, or served in a bowl as a side dish. The great thing about fried apples is that you really don’t need a recipe. I’m sure recipes exist, but you’ll end up tweaking them to your tastes anyhow so just wing it from the start. 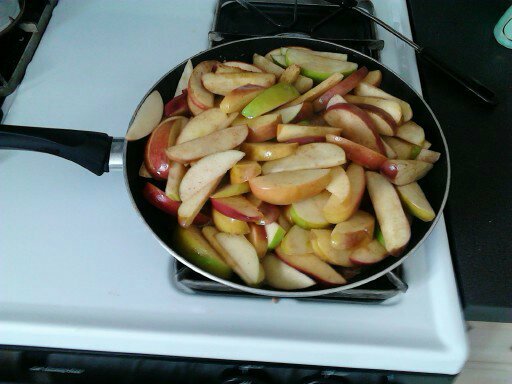 I suggest at least two apples per person and keep in mind that people will want seconds and leftovers. 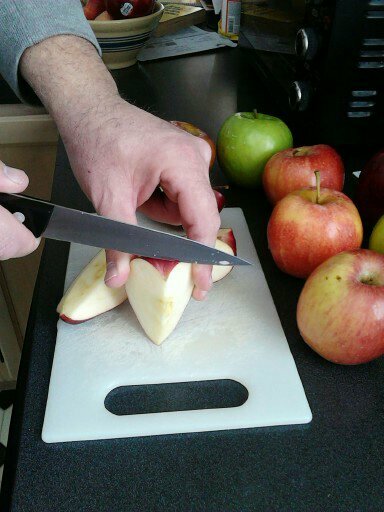 Just to be safe, make it three apples per person; they really do reheat well. We like a combination of sweet and tart apples. Any of the cooking varieties will do. 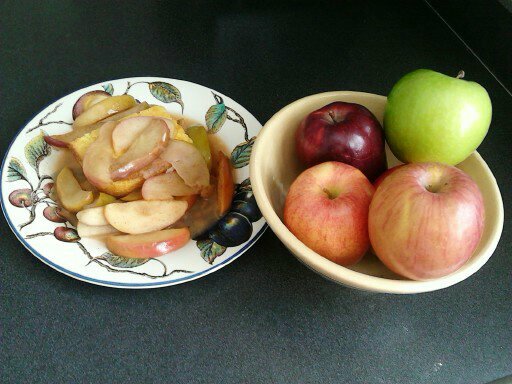 Slice each unpeeled apple in eight pieces and place in a large mixing bowl. Toss the apples with approximately a ¼ cup of brown sugar, several hearty shakes of cinnamon, and salt if using. Heat at least half a stick of butter in a very large skillet because this is one of those recipes that seem to grow as you make it. More butter means more syrup. Transfer the spiced apple mixture to the skillet, cover, and cook the apples until they are tender but not falling apart, stirring occasionally. As they cook, the apple juice mixes with the brown sugar and cinnamon to make sticky syrup. This is where you’ll decide if you want more or less sugar, butter, and cinnamon or to add another flavor like honey or ginger. You really can’t go wrong with fried apples. Be adventurous and make the recipe your own; your family will love you for it! So easy the hubby can do it! Some of the best fried apples are at Cracker Barrel. But in the end homemade are always best.